PSR Sulfur Recovery Catalyst is used to treat with the acid gases containing H2S for the sake of recovery sulfur element and environmental protection in oil refinery, chemical factory, Iron & steel plant and natural gas treatment processes. The conversion of sulfur can reach to 65~75% in a ordinary bumer, 92~95% it react by two stages Clause processes, furthermore to higher than 98% if by three Clause reactors. The loading should be carried out under dry conditions, do not loading it under rainy day or the heavy humidity environment, so as not to affect the intensity. 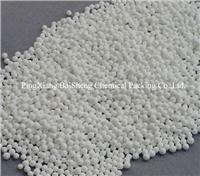 Usually, we recommend to use ceramic ball 6mm at bottom, then 9mm and 19mm, to support and protect catalyst from thermal damage.